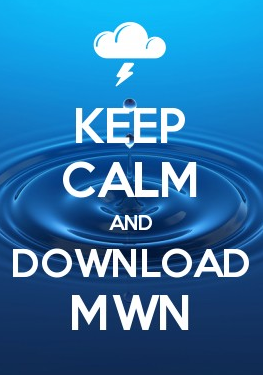 Today's blog looks back at details of the twin violent tornadoes that struck north MS, including Holly Springs in the far southeast metro, some statistics on the year that was, and looks ahead to an unusual river flooding event for this time of year. With a primed atmosphere in place, meteorologists in the area hoped that a forecast for the potential of long-lived tornadoes would be a bust. 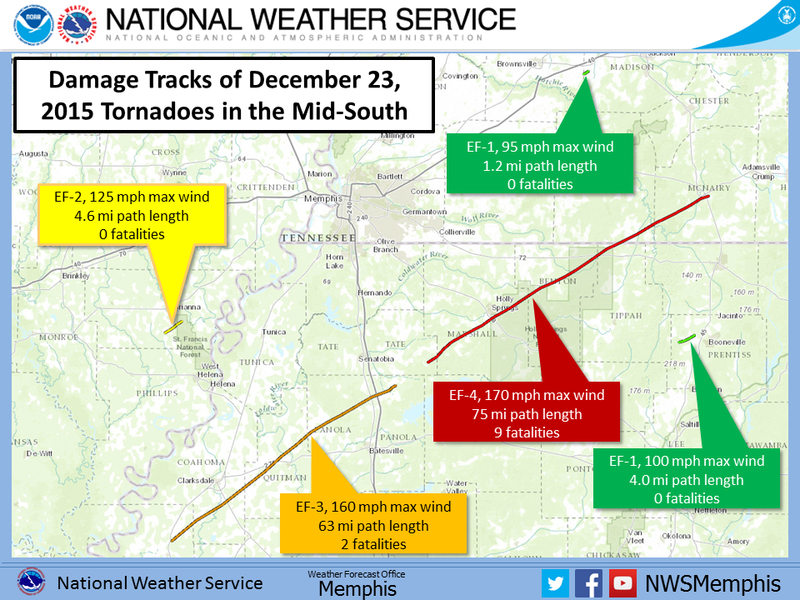 Unfortunately, December 23 lived up to expectations and multiple tornadoes struck the region, including two long-lived violent twisters over north Mississippi that contributed to December being (for the first time on record) the deadliest tornado month of the year. There had only been 10 tornado fatalities this year prior to December 23. 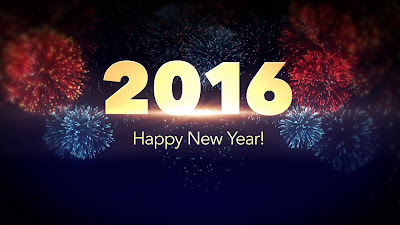 The year ended with (unofficially) 34. The graphic below and this page from NWS-Memphis summarize the events of the day. The two long-tracked Mississippi tornadoes, an EF-3 and EF-4, were produced by the same storm with the first tornado lifting for less than 15 minutes prior to setting back down with even greater force. Marshall County, MS and Holly Springs, on the southeastern edge of our coverage area, experienced high-end EF-3 damage just southwest of Holly Springs before the tornado strengthened to EF-4 (170 mph maximum wind) as it hit Ashland in Benton County. The width of the tornado peaked at 3/4 of a mile and the combined path length of these sister twisters was 138 miles over a period of two and a half hours. In sum, 11 people lost their lives from that supercell, which continued into the Nashville metro area early in the evening, prompting additional tornado warnings. The Weather Channel has called the first of the two north MS tornadoes the fifth worst of 2015 and the EF-4 the worst of the year nationwide. A scary afternoon across north Mississippi to be sure! 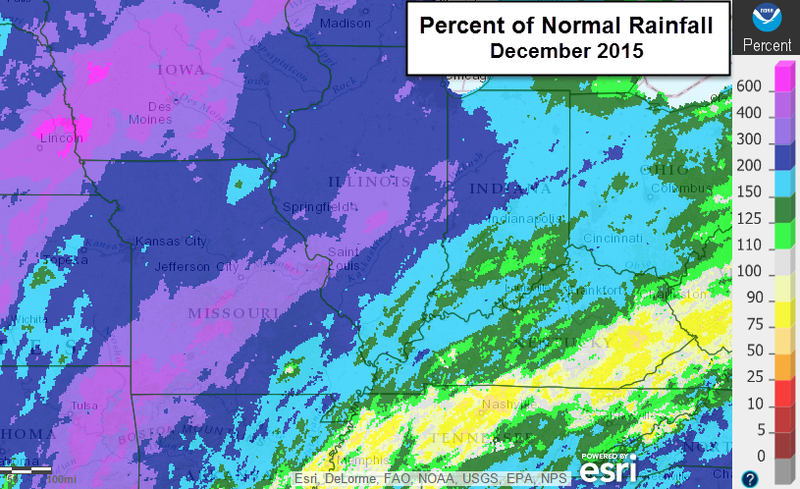 Precipitation totaled 52.66", which is 1.02" below the long-term average and about 5" less than 2014. March 5: 3.1" of snow was the 8th snowiest March day on record. 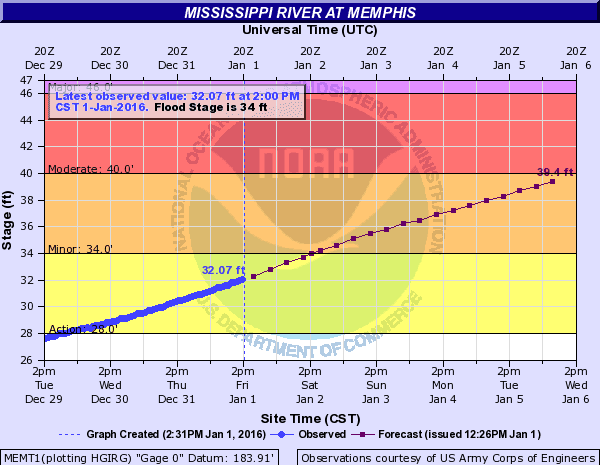 For the first time since the spring flood of 2011, when national news media stepped into flood waters at the foot of Beale Street and the Mississippi River crested at 48 feet, the river will eclipse the 40-foot mark next week. It is an unusual time of year for a Top 5 flood event on the Muddy Mississippi in Memphis, but unusually heavy rainfall the past month in the Middle Mississippi River Basin has produced a sea of water that has to go somewhere. That somewhere is downstream! Rainfall during the month of December in the Mid Mississippi and MissouriValleys, as percent of normal. Large areas of the basin received 2-5 times their average December rainfall, resulting in Flood Warnings throughout the region and downstream to the Mid-South. Graphic courtesy NOAA. Though peak crests above 43 feet have been revised down, the forecast and Flood Warning in effect for the Memphis gauge still calls for the river to reach 41 feet at Beale Street Landing a week from today, January 8. This level is well above the flood stage of 34 feet and is considered "moderate flooding" in NWS vernacular. Local safety and preparedness officials are taking no chances and preparing for higher water just in case. Sand bags are at the ready at General DeWitt Spain Airport north of downtown (which was under 6 feet of water in 2011 and has since been nearly completely re-built), a portion of North Second Street will be closed and inflatable water barriers installed near Mud Island, and electrical equipment in Tom Lee Park will have to be re-located. 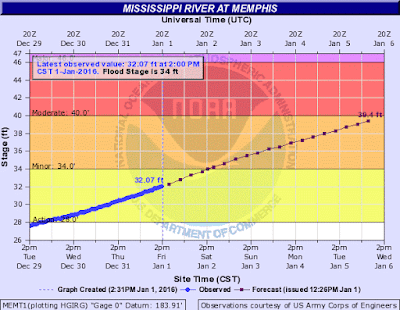 The hydrograph, or river forecast, for the Mississippi River at Memphis shows a climb of over a foot a day for the next several days, with the river eclipsing flood stage tomorrow and cresting at 41 feet on January 8. We'll continue to monitor the situation, but fortunately outside of a lot of water over deserted Arkansas farmland and swollen tributaries such as the Loosahatchie and Wolf Rivers and Nonconnah Creek, the impacts should be minimal. Upstream, there are much bigger issues as areas of Missouri deal with flood waters not seen since the Great Flood of 1993. 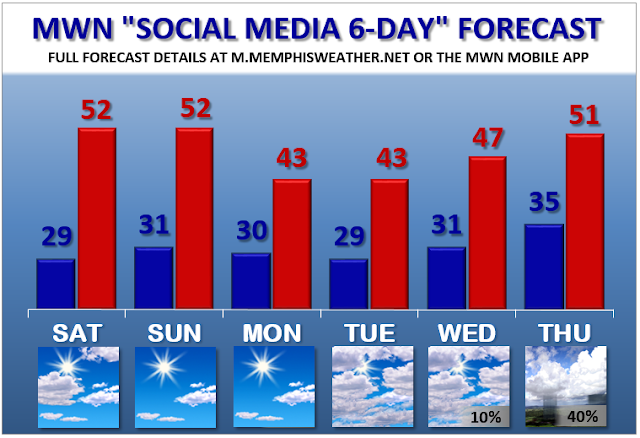 If you're heading to the sold out AutoZone Liberty Bowl or just taking down Christmas decorations, the weekend looks to be a good one with seasonal temperatures and and abundant sunshine. Lows will drop into the 20s in the suburbs the next few nights, but highs will rebound into the lower 50s during the afternoons this weekend. A reinforcing shot of cooler air arrives early next week, but no rain is in the forecast through the middle of the week. Long-range models point to a blast of cold air by mid-month for you cold weather lovers.